Sebastian's race didn't get off to the best of starts with him being pushed from 4th down to 6th in the run to the first corner. Things however would go from bad to worse when the German came across Bruno Senna into turn 4 sustaining heavy damage to the rear of the right sidepod and crushing at least one of the exhaust primaries. The shunt ended Senna's race but the young German now facing the wrong way continued unperturbed by the damage to his RB8. My initial reaction when seeing the damage was that aerodynamically although the car was now asymmetric it wouldn't encumber his performance drastically. In fact my immediate reaction was I'm sure Adrian will be glad that damage is on the right side of the car with it being a clockwise circuit and most of the high speed corners turning left. 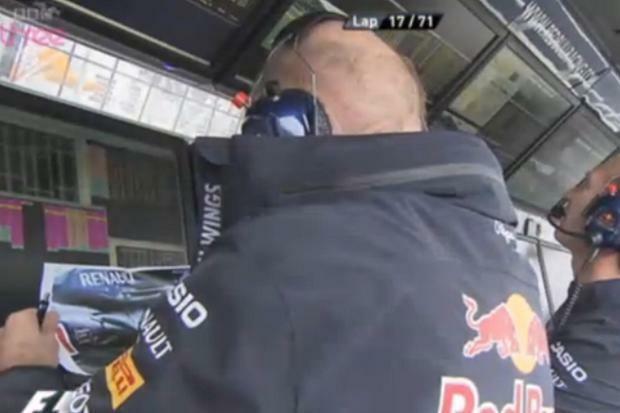 Above: Adrian Newey had Sebastian pull off the racing line alongside the pitwall so they could photograph the damage to the RB8 as it passed. He inspects the damage to assess what aerodynamic impact it may be having on his design. 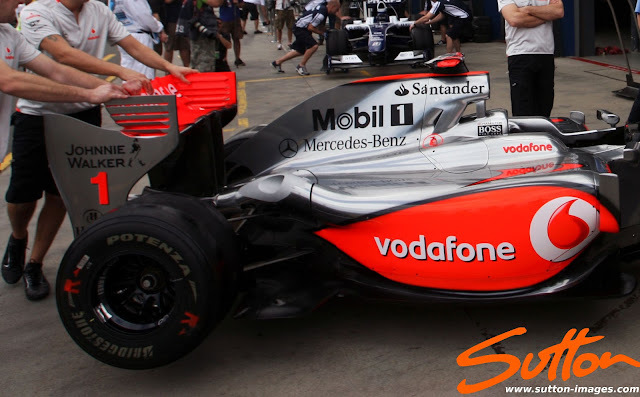 Alongside that my brain shuffled through car designs like a fruit machine until seconds later: Bing, Bing, Bing I have a line of cherries and I'm thinking of the McLaren MP4-24 of which featured a floor design echoing the damage to Sebastian's RB8. Forward of the exhaust region damage, the floor was also damaged at its edge (Marked by yellow arrows in the picture below). This damage once again was extremely fortunate with the floor being turned upward in just the right place. The first upsweep created by the damage mimics the profile of the Sidepod allowing the air to turn down the floor instead of cascading off. Around 8-9 inches back the floor had been stripped and three pieces of carbon were acting as aerodynamic pieces. The smallest of the three resided above the floor and further helped to encapsulate the airflow above the floor, meanwhile below the floor 2 elements would work in unison to create a vortex that would ultimately help to create a barrier at the floors edge. 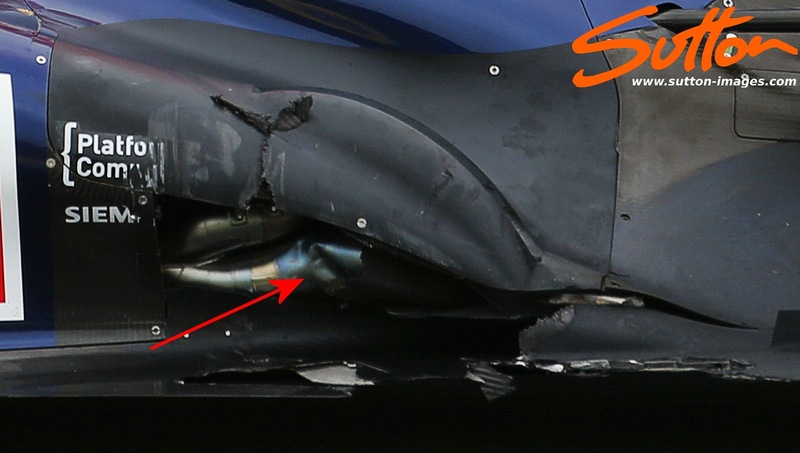 Obviously the damage to the floor was not the only impact on Seb's RB8 with a large hole featuring in the rear of the Sidepod exposing the exhaust. 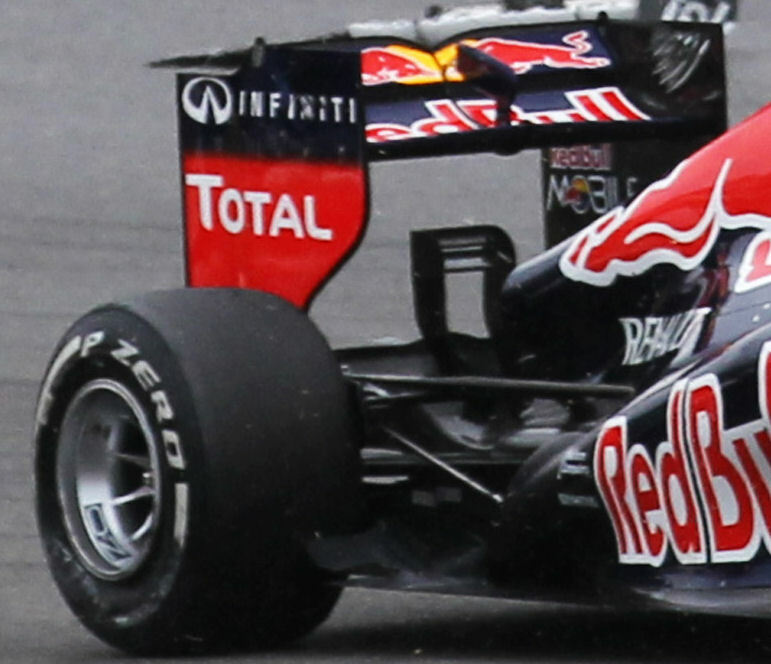 The hole expanded the point around the RB8's star feature this season the 'Cross-under Tunnel' allowing more airflow into the region. Due to the way that region is constructed the panel in front of the Tunnel was destroyed and without it the airflow echoed the Williams FW34's ethos. The intention of the Williams design is to utilise airflow that enters the Sidepod by means of extraction with the exhaust gas. As the Exhaust primaries on the RB8 were now exposed to this airflow they would help to navigate this airflow to the tunnel region as it's entrance is now exposed to both airflow regimes. On top of this the exhaust channel itself was broken away from it's usual position and although I have no clear picture from above the exhaust channel, from the side pictures it would suggest a break in the channel exists. This break would allow airflow to move between the upper and lower surface of the exhaust channel that wouldn't normally be viable. It could be argued that this allowed exhaust gas to be re-ingested and would also help with the flow structure entering the cross-under tunnel. A point worth noting is that had Red Bull not recently redesigned their cross-under tunnel the aero impact may have been altogether different. Previously the RB8's cross-under tunnel featured 2 inlets and 2 outlets, however since India the team had run with a much shorter ramp profile to their design which simply featured one inlet and outlet. The damage to Sebastian's RB8 was not limited to the bodywork but also damaged both his onboard Radio and the exhaust. Communications from the team were still clear but the team could not hear their driver clearly. In terms of damage to their exhaust, the impact wielded quite a dent in one the exhausts primaries. Normally with damage of this magnitude I'd consider the impact on both engine power and longevity both of which I'm sure the team were concerned about. However in Sebastian's recovery from the incident I can find no reference to them dialing back the revs or changing the engine mapping. Sebastian continued to use full revs along the two long straights for his first stint pushing hard to recover the many places he had lost under the spin. 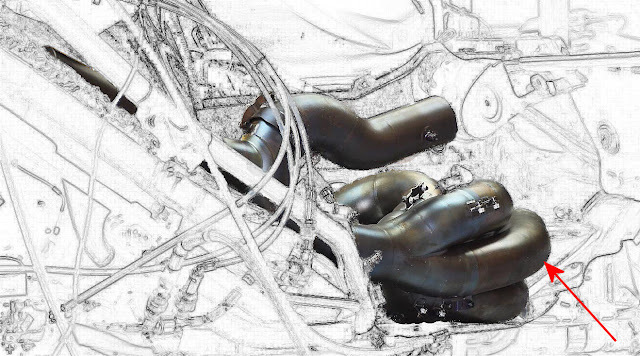 Red Bull opted to use a Resonator Chamber from Silverstone onwards (My original article looking into this: http://somersf1.blogspot.co.uk/2012/07/red-bull-exhaust-resonator-expansion.html) which will have undoubtedly helped to balance any inaccuracies formed by the new internal exhaust bulge. 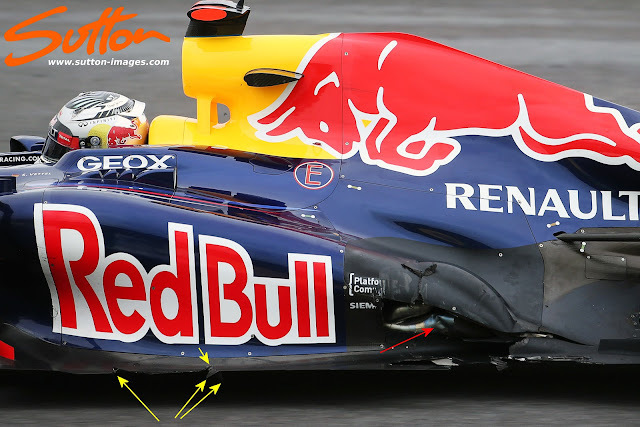 Above: The image above is one I used earlier in the season to depict the Resonator Chamber on the RB8 however the red marked arrow shows roughly the location of the indentation caused in the Senna incident. On the other side of the car further damage can be seen to the floor just ahead of the rear wheel, this was due to the impact sustained as Sebastian was going backwards and Senna's front suspension broke due to the forces at work. Going back to engine maps/torque maps, diff settings and engine revs: If were to look at the signature Adrian Newey 'Butterfly' Steering Wheel in the picture below we can see that Red Bull have a multi function 'TYRE' rotary knob which allows them to grade all sorts of settings based on the conditions and tyres in use. Selecting one of these presets should override the other dials allowing the driver to focus on the task at hand. We can also see that for each tyre type (Dry, Inters, Wets) there are several settings pertaining to a larger degree of adaptability (I'll mention this throughout the rest of the race report below) As we can see the driver also has two thumb wheels to control the differential and torque map settings ideally placed for swift modification but due to their locality it makes it difficult even with onboard footage to see if these are being used. Upon recovery from his spin the first victim on his now seemingly endless up hill struggle would be the driver he nicknamed the 'cucumber' Narain Karthikeyan. He dispatched of Narain in the middle of the Senna S's who obliged by moving over to the left as Seb overtook him just before the Yellow Flag zone, for that lap started into turn 2/3. Above: Sebastian lines up to overtake Narain into turn 2, we can see that the Electronic Flag Board is displaying the Yellow Flags however no dash lights are illuminated indicating that the drivers will be under yellow flag conditions when they pass that marker. On lap 3 the yellow flag zone ran from turn 1 until half way alongside the pit exit with the electronic Flag Board showing Green on the right as Seb lined up to overtake Charles Pic (although the pass wasn't completed until the apex of turn 4). Toward the middle of the lap he overtakes De La Rosa at turn 8. 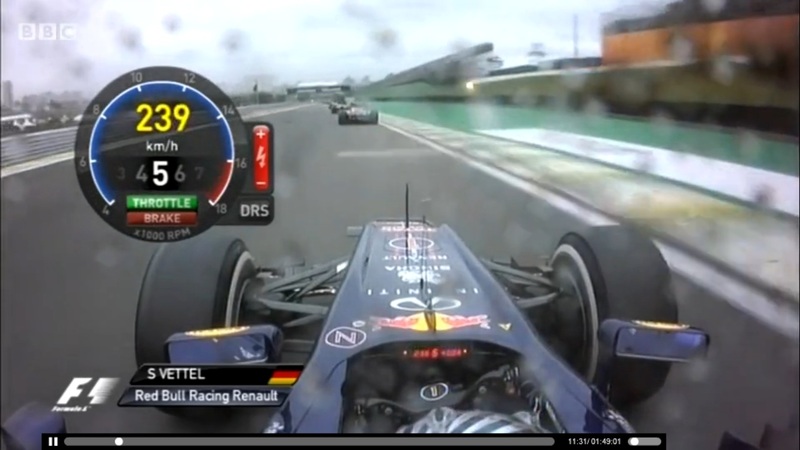 Above: Sebastian approaches the Toro Rosso of Jean-Eric Vergne on lap 4 whilst both the electronic flag board on his right and dash indicators show a yellow flag situation. Although I don't have the photographic proof I believe the same scenario was used by race control / the marshals for lap 4 covering the potential for anyone exiting the pitlane joining into a battle for position. The problem is the inconsistency between electronic flags and the good old fashioned waved ones with the latter taking preference. As he continued around his fourth lap Seb overtook Glock into turn 8. Pass on Petrov on Lap 5: The yellow flag zone ran from turn 1 until half way alongside the pit exit just as it had for the Charles Pic pass on Lap 3. Turn 6 Schumacher pulled over to allow Sebastian and Heikki to pass having picked up a puncture and was heading back to the pitlane in order to change tyres. Lap 6 and the yellow flags have been retracted with Seb overtaking Heikki into turn 1, during the lap Mark Webber drops it in an incident involving Ricciardo in turn 1 (Leaving more debris on the track in that region) and falls behind Sebastian. Sebastian's then proceeds to pass the Toro Rosso driver along the next straight who does little to defend against the charging German. At the end of the lap he gets a good tow behind Rosberg and overtakes him into turn 1 where we now start to see the solid Yellow/Red flags displayed. Lap 8 and the yellow/red flags are being shown into turn 1,2 & 3 but with DRS activated Seb makes a pass on Paul Di Resta into turn 4. Next up is Kamui Kobayashi who is visually struggling in the damp conditions having already used the new run off area on the lap into turn 1. Yellow Flags are shown on the electronic boards and dash into turn 8 and Sebastian is forced to slow and short shift whilst following the flailing Kobayashi. It's clear at this point the RB8 simply has much greater traction than the C31 and as the pair go under green conditions at turn 13 Vettel closes and uses the tow to pass the Japanese driver. 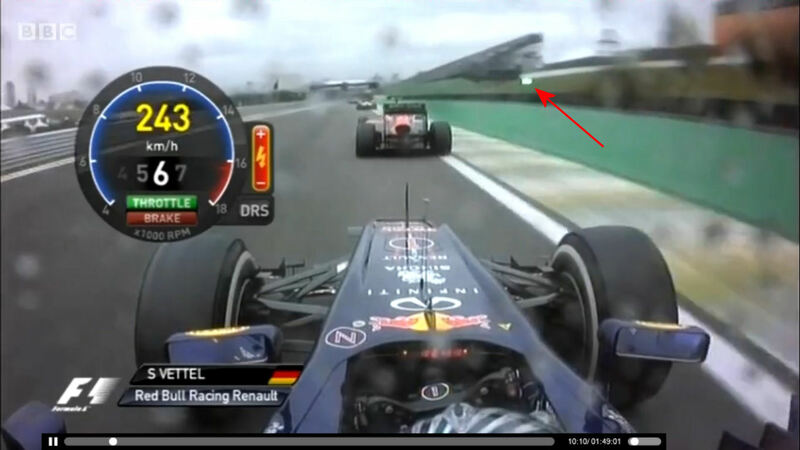 Sky started the FlagGate controversy by claiming initially that Seb had passed Kamui here under yellow flag conditions when in fact the electronic boards weren't flashing and no dash lights were visible. At the end of lap 8 Mark Webber having already been involved in his own incidents and now at the rear of the pack went into the pits and took the intermediate tyres giving the team a sighter on how Sebastian may fare on the same rubber. Meanwhile Sebastian's storming drive on the Medium compound tyres whilst lapping at a pace consistent to the leaders found himself back upto 6th position. With him now behind Felipe Massa on the track and the rain starting to affect the lap times (Lap 8: 1:29.701 & Lap 9: 1:30.824) the team decided to pit him for Inter's to cover off Fernando who had also pitted for the Intermediate tyres. As he exited the pits he made a change to the top left dial on his steering wheel to the 'Inter' setting which in turn will adjust the engine map. This placed Seb back in 17th just behind Webber who then proceeded to overtake Ricciardo (in turn 5) that was in front of both of them. The Toro Rosso driver naturally yielded to Sebastian in between turn 6 & 7. Lap 11 and both Mark (in front) and Seb come off the 3rd turn with DRS available and dispatched of Kimi Raikonnen. In turn 8 the pair dispatched of Karthikeyan who moved over allowing them by, then in turn 9 the Red Bulls swapped positions as Mark allowed Sebastian by. With the deployment of KERS by Seb out of turn 14 it was obvious to see that even with the Inter's on traction is still limited as the RB8 squirmed a little under acceleration. Lap 12 and just as Seb is coming into turn 3 he is greeted by the slower moving HRT of De La Rosa who moves over to the left not before Seb gains a little tow off of him and catapults him toward the DRS zone. This overspeed allows him to pass both Charles Pic to his right whilst mounting an assault on Nico Rosberg who had stayed left. He was unable to pass Nico by turn 4 but his German counterpart starting from the left had compromised his entry point but squirmed off toward turn 5. 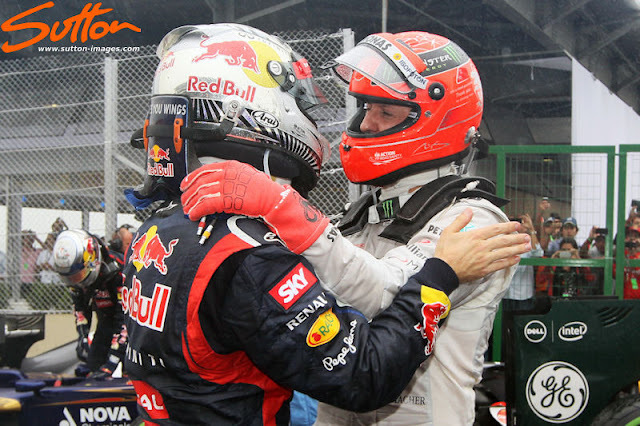 Biding his time and lifting a coasting much more than usual it was clear to see the RB8 had much more balance than the W03 throughout turns 6 – 13 where Seb drew up alongside and dispatched of Nico with the use of KERS up the hill. Lap 13 and Sebastian once again caught up with a slower car heading into turn 3 making easy work of Petrov he once again had DRS available down the main straight toward turn 4. This put him onto the tail of Heikki as he squabbled with Kobayshi. Meanwhile Sebastian's main title protagonist was being held up by a Toro Rosso (Vergne) still running around on the medium tyres. Lap 14 and with Sebastian once again in the DRS zone the Red Bull driver now chased Kobayshi toward turn 4 with Felipe Massa just ahead of the pair of them still tip toeing around on the Medium tyres making it very easy for Kamui and Seb to make the pass out of turn 5. Just like their previous encounter Seb made fairly easy work of the Japanese driver overtaking him into turn 1 on the start of lap 15 promoting Sebastian to 5th. Between Laps 14&16 the front runners who had continued on the Medium tyres are now squabbling for the lead with Hulkenberg over hauling Jenson Button for the lead. Both drivers times fell below the Intermediate runners but Nico managed to overhaul Jenson on lap 17. Lap 18 and Fernando decides to pit once more taking on the Hard tyre promoting Sebastian to 4th who pits a lap later (Lap 19) as the circuit starts to dry once more and the Intermediate's start to become ineffective. Fernando does enough during his in and outlaps to once again stay in front of Sebastian who are once again 4th and 5th respectively. 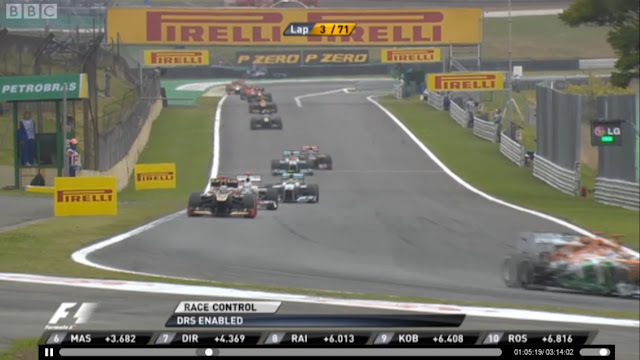 End of Lap 20 and the Safety car is out. When the Safety Car came in on Lap 29 Sebastian used an aggressive rear tyre warm up strategy and sawed away on the the wheel to heat the front tyres. However once the racing got back under way he had Kobayashi for company to his left into the first corner and Mark Webber to his right. His Australian team mate over cooked the braking and went off into the new run off area. 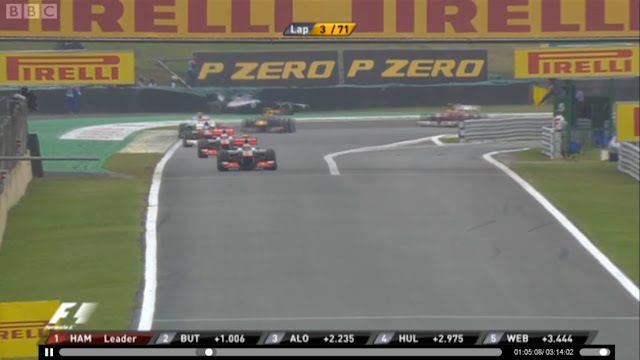 Kamui however unsettled the balance and sped off past Vettel toward turn 2. On Lap 32 Kamui put the move on Fernando only for him to return the favour into turn 1 on Lap 33 all the while Sebastian was hovering hoping to pick up the pieces and whilst having DRS caught upto the back of Sauber only to hit the limiter (The full 18,000rpm) at the end of the straight before turn 4. Lap 34 and we can now see how much more downforce the RB8 has bolted on with Sebastian using all of KERS on the last straight in Lap 33 just to hang onto the back of the Sauber. Once through the Senna S's although a couple of blips of KERS and DRS were in operation for Sebastian the Ferrari of Felipe Massa still came past around the outside of turn 4. A reinvigorated Felipe in the tail end of 2012 has certainly played the team game and his presence in front of Sebastian would be sure to put the pressure on the young German. He piled on more pressure on Lap 37 when he overtook Kamui putting himself squarely between Fernando and Sebastian. With his Front Left Tyre now starting to show signs of some hefty wear Sebastian made his second stop on Lap 52 changing to the Medium tyre exiting in 10th place. He forgets to make the alteration to his Steering Wheel 'Tyre' Knob on pit exit and squirms out of the pitlane, more sideways action ensues out of turn 4 until he makes the alteration on the way to turn 5. On Lap 53 whilst making a rash move down the inside of Lewis Hamilton, Nico Hulkenberg crashed into Lewis ending his race with front right suspension damage. Red Bull saw this as an opportunity with the rain still falling to switch Sebastian back onto Inter's, with Lewis out and the competitors further down the road he still lay 10th. With 15 laps left and Fernando now in 4th Sebastian would still be crowned Champion. However with a likely drive through penalty for Nico Hulkenberg due to the collision with Lewis he'd need to grab a few extra places and go all out attack. The bad news for Sebastian was undoubtedly the sight of the Sauber of Kamui Kobayshi as he exited the pits in front. Having been stuck behind Kamui for some time before I'm sure his heart must have sank. However this was when the track conditions suited the Sauber, with the weather turning the advantage now very much lay in the favour of the higher downforce RB8. Sebastian made quick work of Kamui overtaking the Japanese driver on lap 56 but mainly due to Narain getting on the racing line exiting turn 3 compromising Kamui's exit. Seb couldn't get the pass done down the straight with both drivers having DRS. 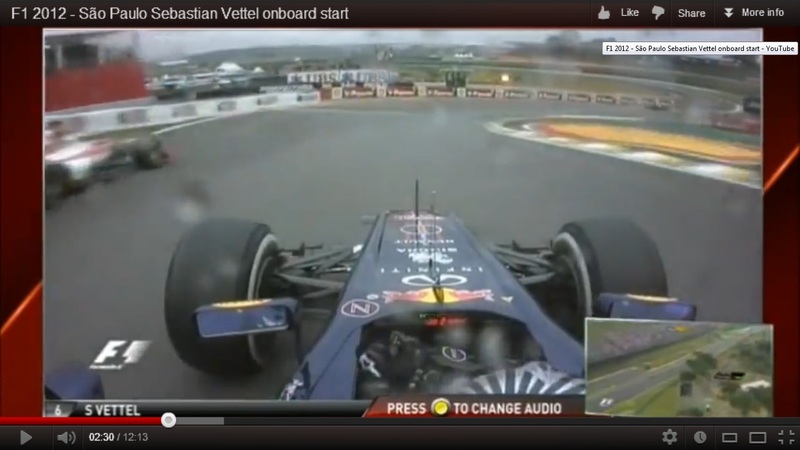 However Kamui had compromised his exit speed for turn 4 and Seb capitilized. The next two laps were key for Seb and he posted bar far the the quickest times out on circuit at the time with a 1:25.927 & 1:26.927 respectively. On lap 63 having followed Michael closely for half a lap, Michael pulled over to allow Sebastian past between turns 5 & 6 promoting Sebastian to 6th a place he would finish the race in. This move to me perfectly symbolized the changing of the guard with Sebastian edging one more championship closer to the stellar 7 championships won by Michael. 2. Fractured primaries & / or collector resulting in immediate or incipient failure. 3. Terminal damage to LHR suspension. 4. Structural damage to x-over tunnels and exhaust trough. But as in Abu Dhabi luck (ahem) went Seb's way. I can say this with authority as I have my Senna S tee-shirt on. Great article Matt. As for your steering wheel: toilet roll cores and sticky-backed plastic or commission Will G to do it.